WintherStormer released their fourth electronic album called «Ground connection» with a concert in Oslo on January 28th, 2011. WintherStormer has specialized in making improvised woodwork music to high acclaim. Electronics and acoustics blends in their music, and forms and patterns emerges like the warm wind exposing shapes in the glacier. With this new release the band wanted to lift music with analog modular synthesizers to new territory while staying true to their own roots. WintherStormer is music without borders and identities. A music which oscillates between some very daring psychedelic moments and beautiful electronic passages, which are situated in the era of Schulze and Ashra Tempel. Music for very curious and risky ears! The WintherStormer logo on the CD made by Terje Bakkeløkken. English press release available for download. Bajkal Records 222020, released January 2011. The fourth CD by WintherStormer. More than 3 years passed by since WintherStormer’s last opus, the fascinating Electric Fairytales. And the Norwegian quartet didn’t modify at all its approach by offering an anti-commercial album which ties the links between spheres of EM for atmospheres as hybrid as imperceptible and of progressive music to strong psychedelic tendencies. Navigating always on these ambiguous waters, WintherStormer thus offers an always surprising music where the charm hides behind a musical complexity which only asks to be tamed. 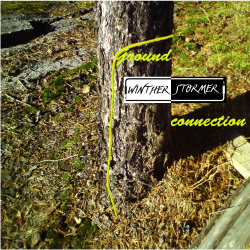 And Ground Connection is the kind of album that will be tamed more easily because for very first time WintherStormer puts away its extreme psychedelism to offer a very nice album stuffed with catchy passages. The superb and amazing "Summer Breeze II" opens Ground Connection with a light hopping rhythm. A rhythm which sparkles on its cymbals, a little as the spirit of the jazz from the years of Soul Music, and which undulates of a beautiful bass line. Resonant sound effects glance through this intro which quietly overturns towards a more electronic approach with a synth with zigzagging chords, recalling the melodious approaches made by Edgar Froese on Drunken Mozart in the Desert. Metallic breezes, strange hootings and creams of synthesized owls feed this pleasant melodious approach which waves such as a cascade. Cymbals make heard their delicate sparkles while "Summer Breeze II" continues to evolve between Krautrock and electronic with a pleiad of sound effects which cross more aggressive synth pads. At around the 7th minute the rhythm calms down and we enter a more atmospheric phase where white noises move around and collide into thunders of a parallel world imprinted by statism. Tabla percussions draw a soft rhythmic ascension at around the 11th minute, grounded up by caustic sound effects and tickled of light guitar notes. A delicate rhythm which increases the pace with steady beatings of an unrestrainedly drum whereas synth solos roar on a structure closer to progressive rock than electronic music. A sensation amplified by the appearance of solos from an incisive electric guitar which weaves the ramifications between progressive rock and EM. With "Connection Lost" we enter into WintherStormer’s psychedelic and abstracted musical universe. We are into Pink Floyd’s own Ummagumma era and its colourful sound effects where drum with ill-timed and metallic rollings are also noisy as the heterogeneous tones which appear from synths in rut. It’s a long track more experimental and abstract than rhythmic, if we make exception of the kind of free rock at around the 4th minute which shakes the house, but the exercise is short-term because "Connection Lost" loses any connection with a sustained music to take refuge in musical, there where everything is allowed without any restraint; that is cymbals forgotten in sound gases, knocks of anvils lost in the statism of white noises, eruptions of synth scratched by heavy riffs of a metallic guitar. In brief, an intense cacophony divided up by short passages liven up by chaotic rhythms. "Beneath the Roots of all Things" is a very good track which takes root with a guitar to echoing loops rolling on pulsations from the bass-drum. It’s a track which takes Arabian airs with a good steady tempo, where synths and guitar trade riffs and solos which transcend in a tribal world with oriental fragrances. Short, catchy and efficient, "Beneath the Roots of all Things"s refrain is the kind that creates earworms. "Ground Connection" is a long mesmerizing minimalist track which starts with a delicate synth wave, adorned by fine bells’ ringing and guitar notes a bit discreet. The synth singing is surrounded by a fine reverberation from where begins a subtle caravans of dunes procession with a bass line with weak undulations and Tabla percussions. And "Ground Connection" will evolve in a minimalism mode on its long journey wrapped with light riffs of guitars and synths as well as spectral layers of a synth to Arabian aromas. A little after the 16th minute, the tempo increases gradually but without ever exploding. It follows a hypnotic tangent, draped that it is by multiple layers of synths and guitars, and always livened up by latent and hypnotic tribal percussions which will guide it towards a more astral finale. Ground Connection is a very nice album which unties the links which are entangling between progressive, psychedelic and electronic music. WintherStormer reached his) musical maturity by offering an album where the harmonies are more present and less scattered than on his previous works. If the album is less caustic than Electric Fairytales it remains nevertheless more nuanced and accessible, thanks to a very delicate subjugating melodious approach. Except for "Connection Lost", which can be difficult of approach, the rest of Ground Connection is taming as easily as its progressive bewitchment. For me, expect the weird and unexpected has always been the case when I encountered a recording of the Norwegian quartet Wintherstormer, led by Terje Winther and Erik Stormer. The music on their fourth release “Ground Connection” is no exception on that with is mixed bowl of analogue synths, sequencers, e-guitar and drums. Still based on pure improvisation, the band’s output remains psychedelic, untamed, and experimental although there’s some more structure and melody found on “Summer Breeze II” next to a progressive rock element. The 14-minute “Connection Lost” is a harsh, bold and profound abstract/experimental piece and very hard to listen to, while the 4-minute “Beneath the Roots of all things” appears to be the most accessible piece on the album with a simple melodic line, lead guitar and catchy drums. The 25-minute title track nicely rounds out the album and slowly morphs on in textural, subdued minimalism in the first part with a bit of movement showing up just after the 16-minute mark. All in all, just forget about “Connection Lost” and one will find out “Ground Connection” has its own strange but interesting characteristics in progressive vintage electronics worth hearing.